My top two favorite types of food are Indian and Mexican. I love the blend of spices and fresh ingredients in addition to the fact that it’s impossible to leave a Mexican or Indian restaurant hungry. I normally want to eat everything (so I do) and feel like I need someone with a wheelbarrow to carry me out. There are no shortage of Mexican restaurants in the Bronx, from my favorite Taqueria Tlaxcalli to the well-known and loved Mexicocina. However, it’s a bit harder to find a really great Indian restaurant here. Not anymore! While we do have places like, Curry Spot, which was good, it still didn’t hold a candle to my favorite places downtown or in Queens. 😦 So, when I read Ed’s post on Welcome 2 the Bronx, I knew I had to find my way over there ASAP. Even better, they had a Groupon deal, $15 for $30 worth of food. So, I hopped on the bus and found my way over to 164th and Morris to meet up with a friend. The outside is unassuming, so if you’re not paying attention, you could miss the place, but do yourself a favor and don’t. We started with an order of vegetable samosas and onion bhaji. Both were delicious, flavorful, and thankfully not too greasy. Because I lack self-control when it comes to Indian condiments, I slathered everything with tangy tamarind sauce, slightly spicy red pepper chutney, and hari (green) chutney. I also ordered a glass of mango lassi, which had a nice balance of thickness and was perfectly sweet. 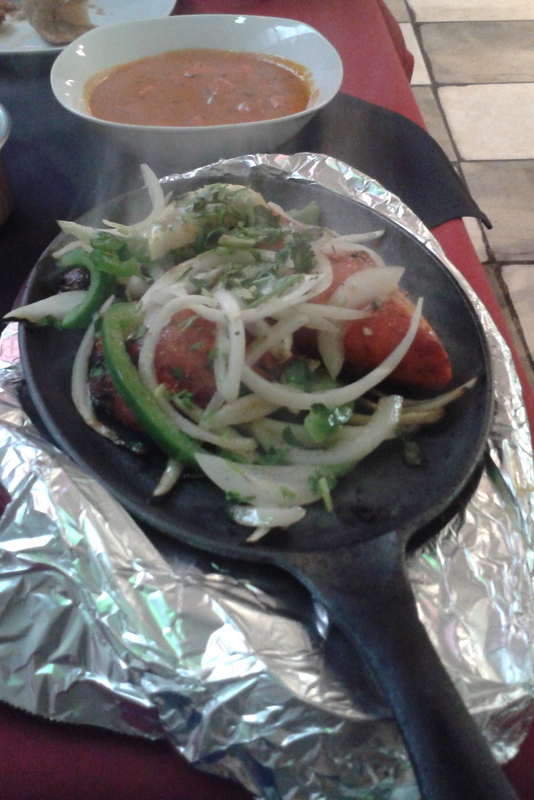 For my entree, I ordered tandoori chicken. It arrived steaming in a small pan, covered in sliced onions, cilantro, and peppers. The chicken was tender and had the necessary right off the grill taste. Our waiter was very friendly and helpful in suggesting dishes for us to try (I’d never had onion bhaji before!) Bonus: they accept cards!